by Kerby Anderson, Point of View: A few weeks ago I did a commentary on the turmoil in Mexico. Since then the situation has gone from bad to worse. The U.S. Defense Department now believes that the two largest Mexican drug cartels have put together a combined military of more than 100,000 foot soldiers. This is an army that rivals Mexico's armed forces. Some believe this development alone could turn our neighbor to the south into a narco-state. The best estimates are that about 7,000 people have died, and that includes 1,000 who were killed in January alone. To put that in perspective, there were about 200 fatalities in Afghanistan including 29 U.S. troops were reported in the first two months of 2009. In Iraq about 400 people were killed, including 31 American troops. . . . The reason for the increased violence goes back to a decision Mexican President Felipe Calderón made about the drug cartels. He launched a nationwide war on drugs and the cartels. They have struck back with a vengeance. Even so he denies that he is losing the war against these drug cartels and points to the fact that the government has not lost any Mexican land. It looks like it is time for more cooperation between the U.S. and Mexico. Fortunately, that appears to be taking place. One counterterrorism official said that "both countries have a common interest in clamping down on the cartels." And both countries must be serious about dealing with this growing threat. I'm Kerby Anderson, and that's my point of view. 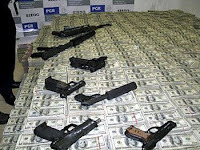 Tags: drug cartel, drug smuggler, Kerby Anderson, Mexico, Point of View To share or post to your site, click on "Post Link". Please mention / link to the ARRA News Service. Thanks!